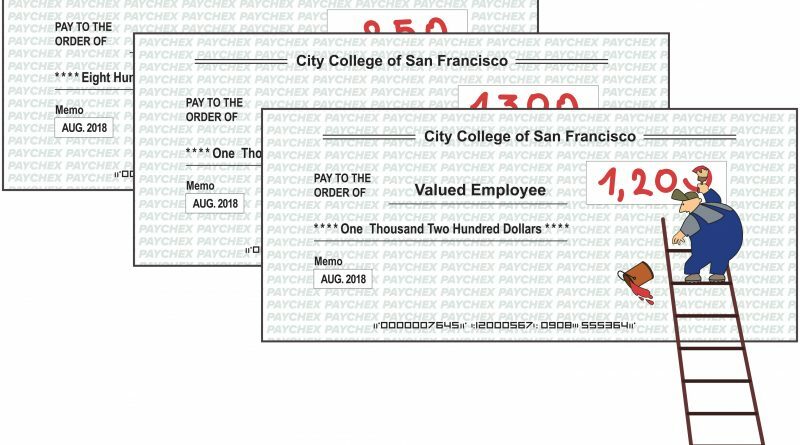 City College’s payroll system for part-time faculty left 155 teachers without pay and 114 underpaid for a month of work on Aug. 31, college Media Relations Director Connie Chan confirmed. Part-time faculty have long criticized the set of processes, called Faculty Load and Compensation, for its dependence on human interactions and proneness to error. In the last year, the college has issued 2,000 off-cycle paychecks to compensate for paycheck errors made through FLAC, Chancellor Mark Rocha told Jennifer Worley, the president of the faculty union, American Federation of Teachers Local 2121. “When you have a combination of both a payroll system that needs to be modernized as well as potential human error […], it creates a domino impact that resulted in the paycheck delay,” Chan said. The Aug. 31 issue raised many concerns from AFT 2121 and the larger college community, whose faculty rely on timely paychecks, often to make ends meet. Besides acquiring late fees, affected faculty could potentially experience lowered credit ratings, late mortgage payments or even an eviction due to the late payments, Worley said. “We just want our people to be paid on time and accurately, and we don’t think that’s a lot to ask,” Worley said. The college has for years promised to fix FLAC, as did Rocha more than a year ago, AFT 2121 Vice President Wynd Kaufmyn stated in a Sept. 4 union release. For affected longtime faculty, the Aug. 31 incident marked a climactic point of an issue left unaddressed for too long. For Rocha, it renewed fervor to implement an up-to-date payroll system for part-time faculty. On the evening of Aug. 31, Rocha had administrators prepare 156 $1,000 paychecks for unpaid faculty to pick up the following day at 33 Gough St., and 12 faculty did so. “This situation is unacceptable to my administration, the Board of Trustees and to me,” Rocha said in a Sept. 6 statement. In his statement, Rocha said all unpaid faculty had been issued checks, and the administration would call unpaid faculty on Sept. 7 to apologize and ensure the checks were received. He added that the administration would “make whole” affected faculty for costs or inconveniences resulting from the payroll error. The most recent issue occurred in large part because faculty assignments were not entered into the payroll system on time, according to the Sept. 4 AFT 2121 release. Moreover, FLAC’s potential for human error is often exacerbated by a barrier that prevents the payroll department from simply handwriting checks to compensate for errors, Worley said. 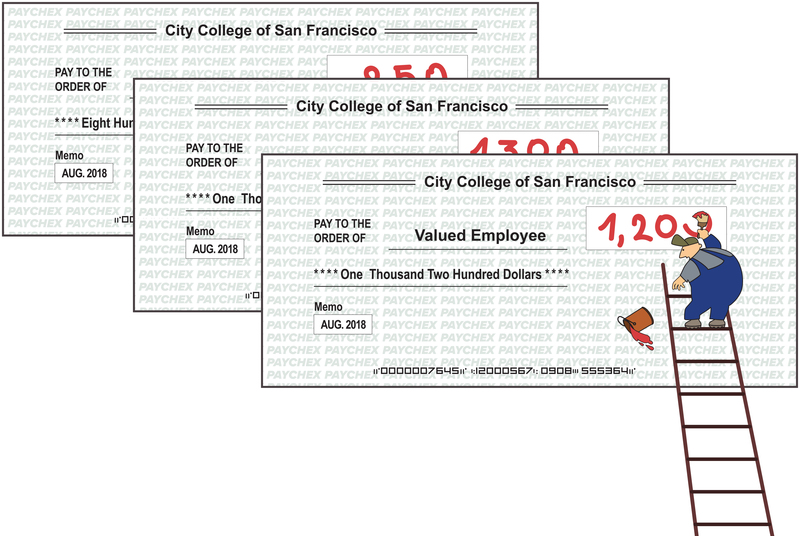 She added that checks must be cut in large batches, and that codes and abbreviations frequently make the pay stubs difficult for faculty to understand. As a result, faculty are often unable to check if they are paid correctly, she said. “No one could really tell me how much I get paid during the process,” said journalism professor Brian Rinker, a first-time City College instructor who received his paycheck about a week after expected. Rinker said after he received his paycheck, the college called to make sure he received it. The college has about 2,300 employees, Chan said. She added that of the affected faculty, there were probably two or three people still experiencing paycheck delays after Sept. 6. As of a Sept. 18 interview with The Guardsman, all unpaid faculty had been paid, she said. Furthermore, all affected faculty had received at least some of their pay by Sept. 11, according to an AFT 2121 release. Rocha has been meeting weekly with AFT 2121 and checking in frequently with administrators to problem-solve the issue with his entire administration, Chan said. Vice Chancellor of Human Resources and Employee Relations Dianna Gonzales, who did not respond to requests for comment before press time, is set to present a brief summary of the faculty payroll business process at the Sept. 27 board of trustees meeting. It will be held at the college’s Chinatown Center in Room 402 after the reports from constituent groups, which begin at approximately 5:30 p.m.
← High housing costs in San Francisco; Free City becomes more of a necessity.